A new low dose three-in-one pill to treat hypertension could transform the way high blood pressure is treated around the world, according to a study published in JAMA. 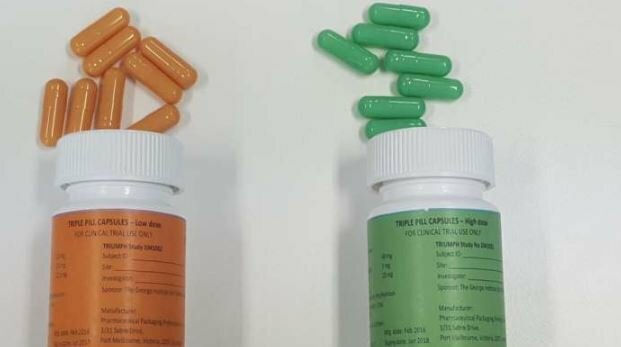 A trial led by the George Institute for Global Health revealed that 70 percent of patients reached blood pressure targets with the ‘Triple Pill,’ compared to just over half receiving normal care. “It’s estimated more than one billion people globally suffer from high blood pressure with the vast majority having poorly controlled blood pressure,” said Ruth Webster with the George Institute for Global Health. The triple pill consisted of the blood pressure medications telmisartan (20 mg), amlodipine (2.5 mg), and chlorthalidone (12.5 mg). The researchers tested an entirely new way of treating hypertension by giving patients those three drugs, each at half dose, in a single pill for the early treatment of high blood pressure. Traditionally, patients begin treatment with one drug at a very low dose, which is increased over time with additional drugs added and increased in dosage to try to reach the target. “This is not only time inefficient, it’s costly. We also know that many doctors and patients find it too complicated and often don’t stick to the process. This new approach is much simpler and it works,” said Webster. The trial enrolled 700 patients with an average age of 56 and blood pressure of 154/90 mm Hg. They were randomly assigned to receive either the combination pill or usual care.